Attach bottom to back with #6 x 3A" F.H. screws. Clamp 77/i6M-long scraps to the legs to make sure the drawer opening will be the correct size. Refer to the drawing above. Position the scraps during dry assembly, and leave in place during glue-up. 3 Dry-assemble the side panels (M) between the upper side rails (C), and the completed side-panel assemblies into the front legs (A) and back legs (B). Be certain that the grooves in the sides of parts C and E face the inside of the night-stand. When you are satisfied with the fit, finish-sand all the pieces. Next, glue and clamp the assemblies, making sure they are flat and square. IMake the drawer guides (O) by starting with a 3/4x3x123/8" blank. Use a dado blade in your tablesaw to cut a 1 '/sxW rabbet into one end of the blank and a 3/4X'/2" rabbet into the other end, where dimensioned on Drawing 2. 2 Change to your regular tablesaw blade, and rip four i/V'-wide drawer guides from the blank. Drill 5/32" countersunk holes, where dimensioned on Drawing 2. Set these parts aside for now. 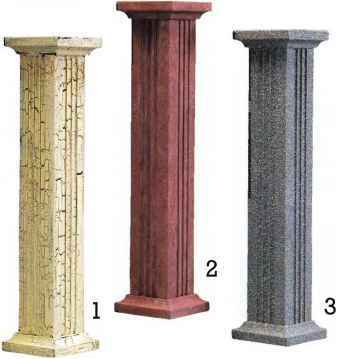 3 Edge-join 14" lengtfs of 3/4M-thick stock to make an oversized blank for the shelf (P). Rip and crosscut the blank to the finished dimensions of the shelf as listed in the Materials List. 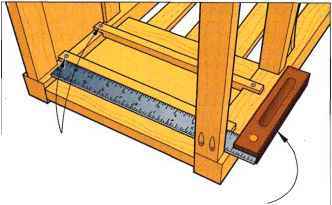 Mount a dado blade in your tablesaw, and cut the tenons on both ends of the shelf to the dimensions shown on Drawing 1. 1 Dry-assemble parts F, G, H, I, J, N, and P between the two side assemblies. See the Shop Tip at left for a method of ensuring that the drawer opening is the right size. 2 When all parts fit properly, disassemble, finish-sand, and glue the carcase together. Note: Center the shelf (P) and glue only the center 3" of the shelf tenons into the lower side rails (E) to allow for expansion and contraction of the shelf. Glue and clamp the lower front rail (J) to the front skirt (H). Then, drive pocket-hole screws to attach the upper front rail (I) to the legs. Align the back edges of parts I and J flush with the back edge of the front legs. Let the glue dry, and then unclamp. Note: The specified width of the drawer fronts and sides (parts Q and R) is based on a vertical opening size in the carcase (between parts I and J) of 7Vi6", with '/¡61' clearance between the two drawer fronts, and '/¡6n clearance between the drawer fronts and parts I and J. The drawer front length of ll3/s" is based on a horizontal carcase opening of IV/2", with '/i6" clearance allowed at each end. If the measurements of your nightstand vary, you will have to adjust the size of the drawer components. IRip a 24" length of W'-thick stock to 35/s" wide for the drawer fronts (Q). Crosscut the drawer fronts to finished length. Rip two 28" lengths of '/2"-thick stock to 35/8" wide for drawer sides (R). 2 Mount a V2" dado blade in your tablesaw, and cut a 3/i6"-deep groove centered in the width of the drawer sides. Note: Accurately centering the groove is an important step in getting drawers that fit properly. Next, switch to your regular tablesaw blade and crosscut the sides to their finished length of 12", and save the cut-off scraps for the next step. Drill countersunk ¥32" holes into the drawer sides, where shown on Drawing 7, opposite. 3 Make a drawer-guide spacing jig from the drawer side cutoffs and '/V'-thick shims ripped and crosscut from W-thick stock, as shown on Drawing 7a. 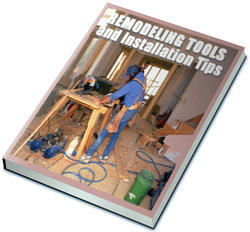 See the Shop Tip, below right, for important information on fine-tuning the jig. 4 Put the nightstand carcase on its side on your workbench. Then, position two drawer guides, using the spacing jig, as shown in Step 1 on Drawing 8, above. 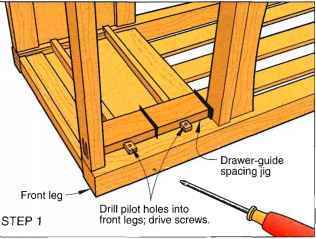 Drill pilot holes into the front legs through the countersunk holes in the drawer guides, and drive the mounting screws. 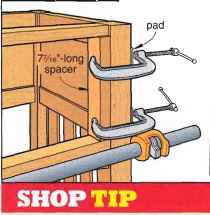 Remove the spacing jig, and use a square to position the drawer guide on the back leg, as shown in Step 2 on Drawing 8. Drill pilot holes into the back legs, and drive the mounting screws. Repeat the process for the other pair of drawer guides. 5Mount a lA" dado blade in your tablesaw, and set it for a '/V'-deep cut. Adjust your rip fence, and then cut the groove for the drawer bottom into the drawer sides and front, where shown on Drawing 7. 6 Cut a V2" rabbet V2" deep in the drawer front ends, where dimensioned on Drawing 7. Note: The depth of the rabbet should exactly match the stock thickness of the drawer sides (R). Z Switch to a V2" dado blade, and cut the '/V'-deep dado for the drawer back into the drawer sides, where dimensioned on Drawing 7. Rip and crosscut the drawer back (S) to size. 8 Glue and clamp the drawer front, sides, and back (Q, R, S) together. Using the countersunk holes in the drawer sides as guides, drill T-fet" pilot holes 3A" deep into the drawer front. Then, drive the screws to attach the sides to the front. Rip and crosscut the drawer bottom (T) to the dimensions listed in the Materials List, slide it into the groove in the drawer sides and front, and attach it to the drawer back with #6x%" flathead wood screws. 9Test-fit the drawers. You may need to sand the drawer guides slightly to get a perfect fit. Work carefully, noting whether you need to remove stock on the top, bottom, or face of the drawer guides. 1 Crosscut 20" lengths of l'/W'-thick stock to edge-join an oversized blank for the top (U). When the glue dries, rip and crosscut the top to 15'/axl 8". Adjust the fit of the drawer-guide jig before gluing it by test-fitting it into the drawer opening. If you don't get a perfect fit on the first try, cut shims that are slightly thicker or thinner until you are satisfied with the fit. This way, you keep all of the clearance gaps equal. Drill pilot holes into front legs; drive screws. Align guides with try square. Drill pilot holes into back legs, and drive screws. HOW TO ASSEMBLE FUNITURE DRAWS?